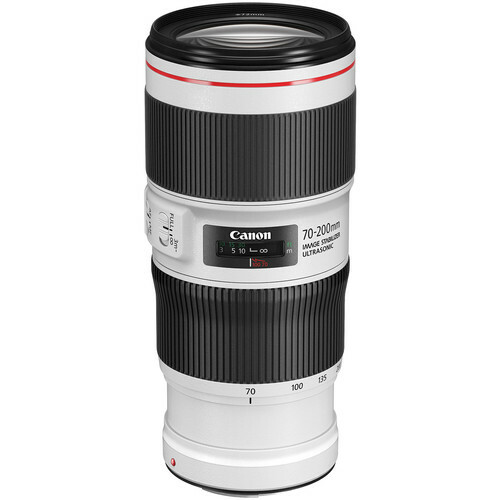 Mixing a relatively compact, lightweight form factor with updated stabilization and performance, the Canon EF 70-200mm f/4L IS II USM is an impressively versatile telephoto zoom. Well-suited for a range of subjects, from events to portraiture to sports, this zoom is characterized by its constant f/4 maximum aperture to strike a balance between consistent performance and portability. Its optical design includes a pair of UD elements and one fluorite element to greatly reduce chromatic aberrations and color fringing. This optimized design, along with a Super Spectra coating, also helps to control flare and ghosting for greater contrast and color accuracy when working in harsh lighting and backlit conditions. Version II of this popular lens also sees the inclusion of a revised Optical Image Stabilizer, which now compensates for five stops of camera shake and offers three distinct stabilization modes to suit different shooting applications. 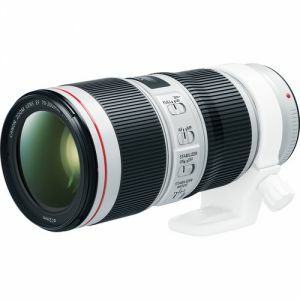 A ring-type USM and internal focusing mechanism also afford quick, quiet, and accurate autofocus performance, as well as full-time manual focus override. Additionally, this lens is weather-sealed for use in trying environmental conditions. 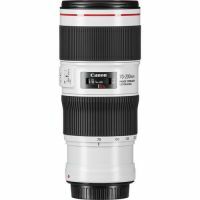 Versatile telephoto zoom is designed for full-frame Canon EF-mount DSLRs however, it can also be used with APS-C models where it provides a 112-320mm equivalent focal length range. An Optical Image Stabilizer helps to minimize the appearance of camera shake by up to five shutter speed stops to better enable working in low-light conditions and with slower shutter speeds. Additionally, three dedicated image stabilization modes are available (Standard, During Exposure Only, and Panning) and can be selectively employed to suit a variety of types of shooting. Focus Limiter switch lets you constrain the focusing to two different ranges to suit different applications: 3.3'-infinity or 9.8'-infinity. Optional AII(WII) Tripod Mount Ring is available and benefits working with the lens atop a tripod or monopod.